A cheesecake recipe inspired by the nation’s best-loved summer cocktail – a G&T. 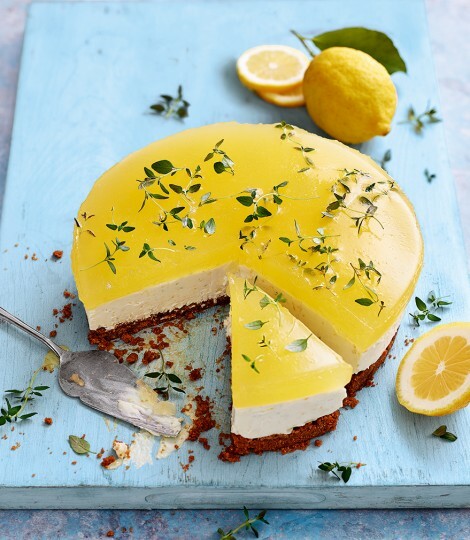 There’s a zingy layer of gin and tonic-flavoured jelly on top of a creamy mascarpone middle and a biscuit base – it’s the summer dessert dreams are made of. If you prefer the real thing, check out my post Gin Cocktails for a variety of tasty cocktail recipes. A classic confection from Germany, known as “Bienenstich Kuchen”, turned into decorative pastries. The crunchy nutty caramel topping contrasts well with the rich and creamy custard filling! According to Wikipedia: “the cake may have earned its name from its honey topping: according to one legend, a bee was attracted to the cake and the baker who invented the cake was stung”. Combine all the ingredients except the additional flour in a mixing bowl and beat well. Add sufficient of the extra flour to form a soft dough and knead only until smooth. Cover and allow to rise in a mildly warm spot until doubled (30 minutes). While the dough is rising, prepare the custard for the filling. Combine all the ingredients except the cream in a large jug and microwave 3 minutes on High until the custard starts to thicken. Beat well and microwave until the very thick custard becomes bubbly. Beat well and allow to cool and refrigerate until quite cold before completing the filling with the added cream. While dough is rising, also place all the ingredients for the topping into a small saucepan and stir over moderate heat until syrupy. Simmer the topping for 5 minutes and set aside to cool slightly before using. Grease 24 cups of two medium size muffin tins with butter. Knead down the dough and divide into 24 portions (± golf ball size). Pinch off balls or roll into a strand and cut and adjust the portions until there are 24 even sized portions. Place the balls into the muffin cups as you go and with the fingertips flatten the top. Allow to rise for 10 to 15 minutes until doubled. While the dough is rising prepare the filling. custard and allow to cool. Place the ingredients for the topping into a small saucepan and bring to boil over moderate heat, stirring. Allow to simmer at least 5 minutes or until the mixture becomes syrupy. Cool to lukewarm. To complete the filling, add the cream to the cold firm custard and beat with an electric beater or blend with a stick blender until completely smooth. 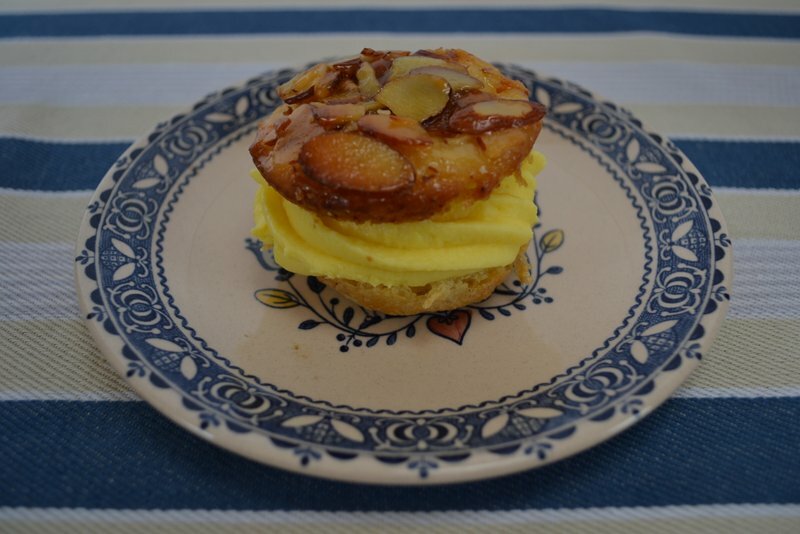 Cut the cold pastries in half horizontally and pipe or spread the custard filling over the base. Cover with the top layers and serve or refrigerate until required. The recipe will make about 24 small pastries – if the balls are slightly larger and a few less pastries are made it will not matter at all. The filled pastries will keep well if refrigerated for up to 4 days. The baked pastries without custard filling freeze well to thaw and fill when required. To freeze half of the pastries and fill only half, cook half of the filling. Recipe by Carolié de Koster from the Art Of Cooking Recipe Book p. 851. This is a neat cheesecake, most suitable for serving in coffee shops or as an elegant dessert, sliced and served plain or surrounded by a fruit sauce or fresh fruit. Pre-heat the oven to 160 ℃. Grease one large loaf tin (2 liter capacity) or two smaller loaf tins (19 cm x 9 cm x 5 cm) generously with butter. Mix the crumbs and cinnamon and sprinkle into the tin(s). Shake to allow the crumbs to coat the sides evenly, then turn out the excess onto waxed paper and reserve for the top of the cake if preferred. Beat the egg whites until just firm and gradually beat in the 30 ml sugar. Add the egg yolks and beat lightly until combined. Place all the remaining ingredients in a large bowl and beat very well for 3 to 4 minutes. Add the beaten egg mixture and beat in gently fut thoroughly. Pour the mixture into the tin(s) allowing at least 10 mm rising space. Sprinkle the excess crumbs over the top, if preferred. Bake for 50 minutes for the large loaf tin or 35 to 40 minutes for the smaller loaf tins, until set. The cake should rise very gradually until set and rounded at the top. 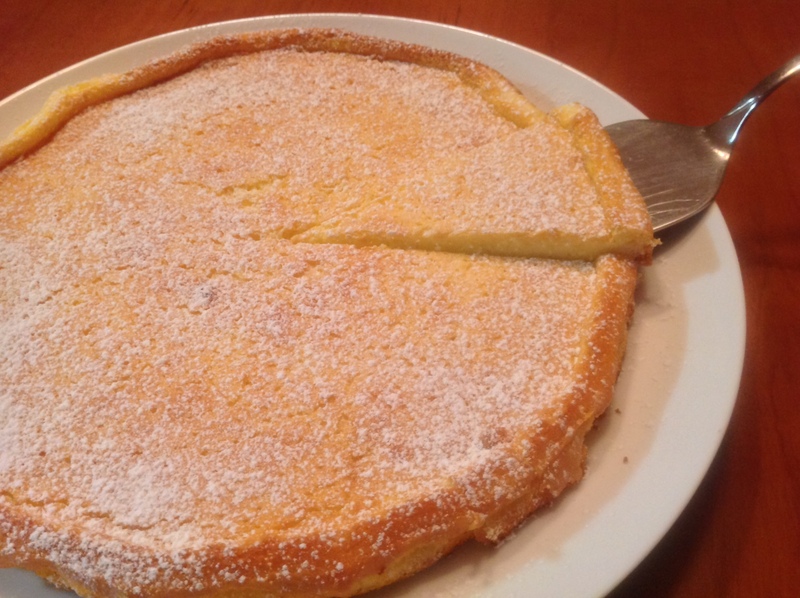 If the cake rises to fast, turn down the oven temperature to 150 ℃. When the cake is firm if tested in the centre with the fingertips, switch off the oven, open the door slightly and place a spoon in the door if necessary. Allow to cool in the oven for 1 hour to prevent shrinkage and ensure the best texture. 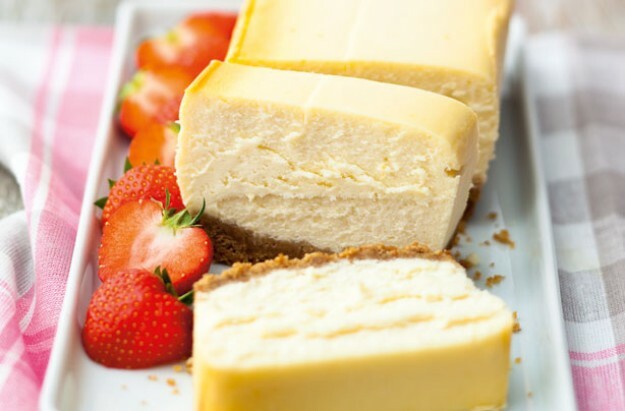 Turn the cheesecake out onto a serving platter and serve while still slightly warm or cool, cover and refrigerate until required. Recipe by Carolié de Koster for the Art Of Cooking Recipe Book p. 611. This cake is almost to good to be true – no soaking of fruit overnight, no baking for 4 hours or more. It is so quick and easy to make, you won’t believe it! But the proof is in the pudding! 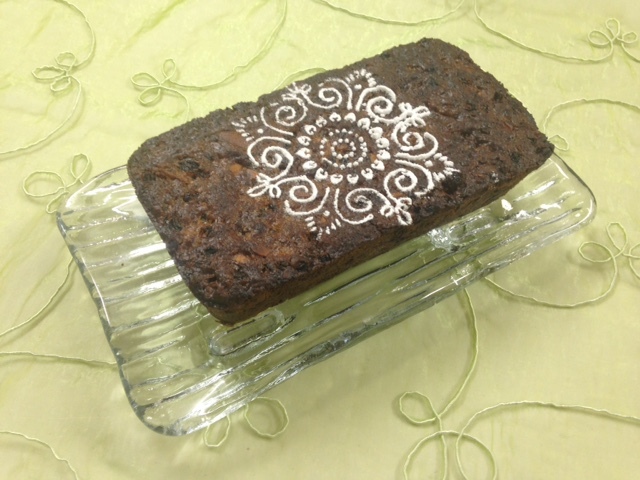 Be sure to also try Carolie de Koster’s Microwave Fruit Cake or Dessert. Pre-heat the oven to 180 ℃ and line a medium bread pan (19 cm x 9 cm x 5 cm) with a 1,25 liter capacity with baking paper and grease it with non-stick cooking spray. Set it aside. 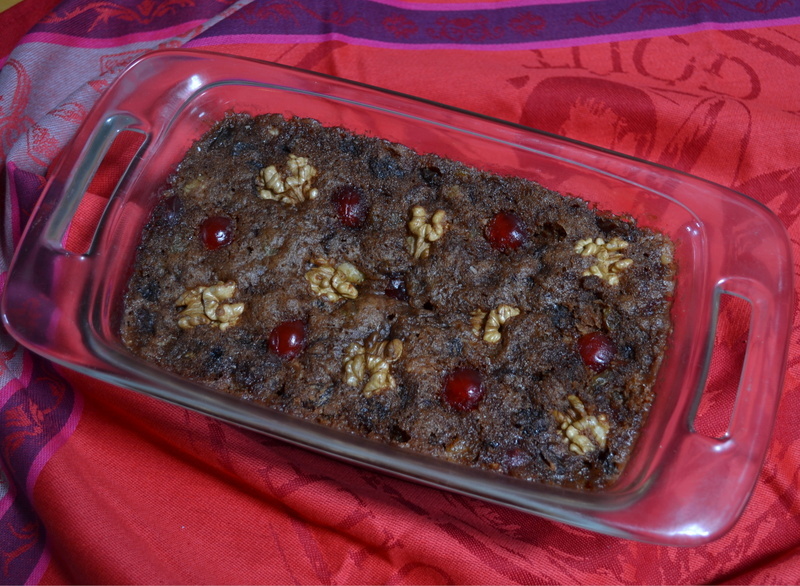 Combine the fruit cake mix, citrus peel, glace cherries, almonds, sugar, butter, orange juice, brandy essence and mixed spice in a medium saucepan and bring the mixture to a boil while stirring. Turn down the heat and simmer for 5 minutes. Set the saucepan aside. Add the cake flour and bicarb of soda to the fruit mixture and mix well. Combine the egg and milk in a measuring jug and whisk it with a fork until combined. Add the milk mixture to the fruit mixture and mix well. Transfer the batter to the prepared bread pan and level the top. Bake the cake for 30 minutes or until set and a toothpick inserted into the middle comes out clean. Transfer the cake to a cooling rack, remove the baking paper and set aside to cool completely. Transfer the cake to a serving platter and drizzle with brandy (optional) and dust with icing sugar before serving or store it in an airtight container until ready to serve. The recipe can easily be doubled. Use a larger bread pan (about 28 cm x 11 cm x 6,5 cm) or oven-proof dish with a 2,25 litre capacity. Moist, delicious and no effort to make and cook in the microwave. May be eaten fresh from the oven or cooled and treated like a traditional cake, covered with almond paste or marzipan only or covered with plastic icing (easy to purchase) as well. 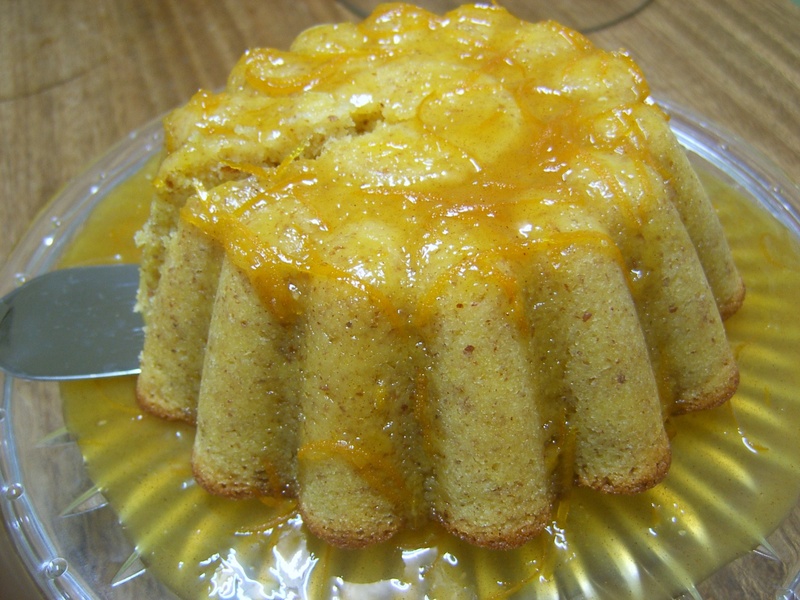 Oblong, loaf-shaped or round containers may be used for the cake and it may be baked in 1 large (2,25 litres) or 2 smaller (1,25 litre), glass or plastic containers. If round dishes are used, line the bases only with waxed paper. If oblong or loaf-shaped dishes are used, line the longer side/s and the base/s with a sheet of waxed paper. Grease the unlined sides of the container/s and the paper well with margarine. Combine the mixed dried fruit, dates, brown sugar, butter or margarine, water and randy in a large bowl. Cover loosely and microwave on HIGH for 5 minutes. Stir well and microwave 3 minutes more. Stir in the bicarbonate of soda and cool to room temperature. Place the dry ingredients into a second bowl and stir until combined. Add to the fruit mixture and mix until blended. Add the eggs, cherries and nuts and stir until mixed. Spoon the mixture into the prepared container/s and smooth the top. Cover with lids or cling wrap and microwave on DEFROST, 16 minutes for the large or 10 – 12 minutes for the small containers until just set. Microwave on HIGH, 4 minutes for the large or 2 – 3 minutes for the small containers to finish off baking until cooked right through. Cool in the container/s at least 15 minutes and pour over half of the brandy. Loosen carefully, turn out and sprinkle with the remaining brandy. Serve as a dessert or cool completely, wrap in aluminium foil and store. 1 medium or 2 smaller cakes or 16 – 20 generous servings. Two smaller cakes are neat and convenient to serve – it is cut and used quickly instead of continually cutting from a large cake which eventually appears untidy and no longer tempting. Store the well wrapped cake/s up to two months and sprinkle with a little brandy, once a week, to keep moist. The cakes may be baked in even smaller ovenproof glass or plastic containers to make little fruit cakes which will be served and eaten with one round of coffee or make attractive gifts, wrapped in cellophane and decorated with a ribbon. Decrease the cooking time if less batter is cooked at one time. Recipe by Carolié de Koster from the Art of Cooking Recipe book p. 898. 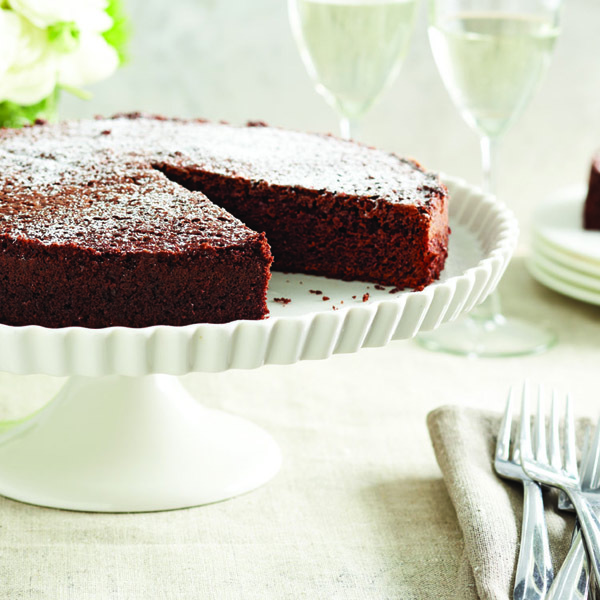 This decadent cake have been adapted from the original recipe by Nigella Lawson. It is gluten-free, which makes it a great option for family members or guests that are gluten intolerant. Preheat your oven to 170 ° C and grease a 22 or 23 cm springform tin with a little olive oil and line the base with baking paper. Sift the cocoa powder into a bowl or jug and whisk in the boiling water until you have a smooth, chocolatey, still runny (but only just) paste. Whisk in the vanilla extract, then set aside to cool a little. In another smallish bowl, combine the ground almonds (or flour) with the bicarbonate of soda and pinch of salt. Put the sugar, olive oil and eggs into the bowl of a stand mixer with the paddle attachment (or other mixing bowl and electric hand mixer) and beat for about 3 minutes until you have a pale, aerated and thickened cream. Turn the speed down a little and pour in the cocoa mixture, beating as you go, and when all is scraped in you can slowly tip in the grounds almonds or almond meal. Let it cool for 10 minutes on a wire rack, still in its tin, and then ease the sides of the cake with a small metal spatula and spring it out of the tin. Leave to cool completely or eat while still warm with some ice cream, as a pudding. Makes: 8 to 12 slices. 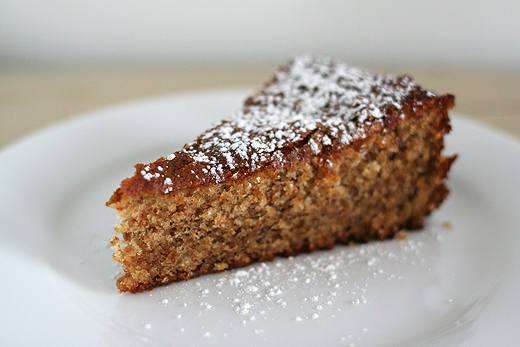 Replace the almond meal with 200 ml cake flour. This is simple cake which can be easily be altered to personal taste by adding different flavouring ingredients. The addition of the olive oil reduces the saturated fat of the recipe. Pre-heat the oven to 180 º C and grease a 22 cm fluted or 25 cm deep ring pan. 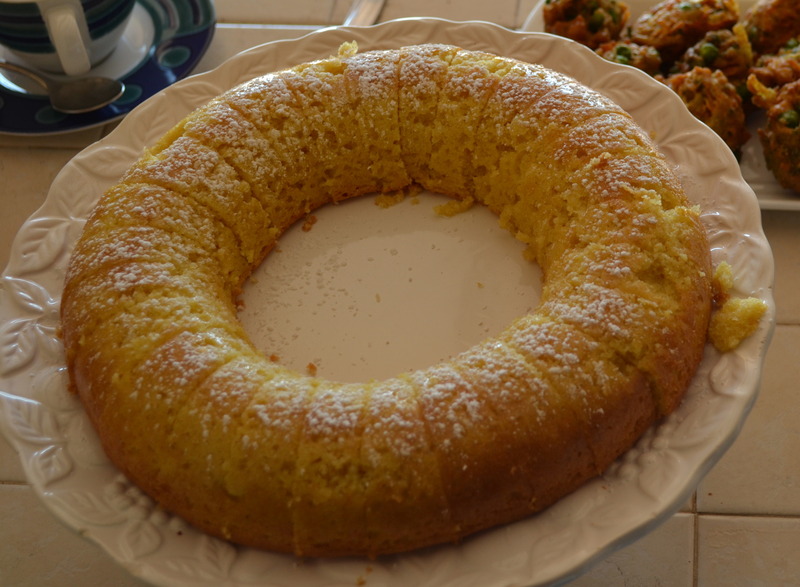 Note: A ring pan such as a fluted “Bundt” tin, “Gugelhupf” or even an Angel cake tin will work well. If using the flaked almonds, sprinkle half of it evenly into the tin at this point. Place the flour, sugar, salt, olive oil, eggs and milk and vanilla essence in the bowl of a food processor or a large mixing bowl. Process or beat with an electric hand mixer until smooth. Add the flavouring ingredients of your choice and mix or process until just combined. Pour the batter into the prepared tin and smooth the top. Sprinkle the remaining almonds on top, if used. Cake for about 30 minutes, until the cake is golden and firm to the touch and a cake tester comes out clean. Turn the cake out on to a cooling rack and allow to cool completely. To make the sweetened whipped cream, place the cream and sugar in a mixing bowl and beat at a moderate speed until stiff and fluffy. Be careful not to over-beat the cream. Beat in the vanilla essence and spoon into a serving dish. Transfer the cake to a serving plate and dust with icing sugar. Serve with the sweetened whipped cream. Recipe by Carolié de Koster from the Home Bakes Recipe Book p. 45. 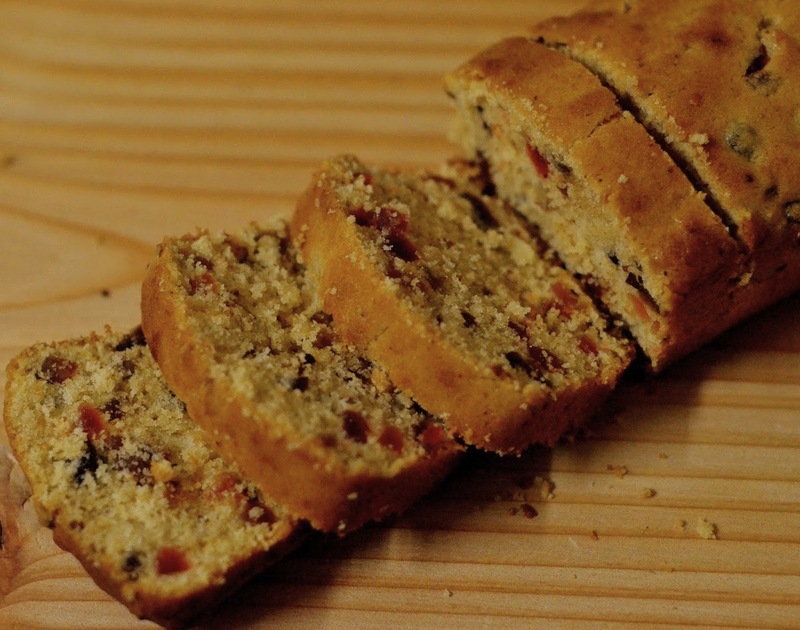 The very different fruit and nut combination used in this moist and delicious cake makes a welcome alternative to typical fruit cakes. It is also known as “white fruit cake” due to its lighter colour. Line a medium-sized loaf tin (about 280 x 110 mm x 65 mm) with non-stick baking paper. Place the hazelnuts on a baking tray and bake at 200 °C for 8 to 10 minutes or until the skins crack. Allow to cool and rub off the skins but leave the nuts whole. Cut the apricots and figs into thin strips and chop finely. Beat together the sugar and eggs until very light and fluffy. Add the nuts, fruit, brandy or Kirsch, flour and salt and stir into the egg mixture. Add the milk and mix until smooth and evenly blended. Spoon the mixture into the prepared tin, smooth the top and bake at 180°C for about 50 minutes or until golden brown and thoroughly baked if tested with a metal skewer. Turn out and allow to cool. Store in an airtight container, preferably refrigerated if the weather is warm. Dust the cake with icing sugar before serving. 1 loaf cake or 20 slices. Recipe by Carolié de Koster’s Art of Cooking recipe book p. 615. This is one of the most exquisite cheesecakes – a treat for connoisseurs! The cheesecake in the photo was made with Featherlight Sweet Pastry (recipe at the bottom of the post), but it may also be baked with a biscuit crumb crust which is equally taste but quicker to make. Grease a 280 mm to 300 mm spring-form tin with butter. Line the base of the tin with baking paper and grease the sides as well. This is essential to ensure that this large cake can be transferred to a serving platter without breaking. Place all the ingredients for the crust in a food processor and process until evenly blended. Press the crumbs evenly onto the base only. To make the filling, separate the eggs and beat the egg whites in a mixing bowl until firm and set aside. Beat the egg yolks and all the remaining ingredients for the filling very well for 5 minutes. Add the beaten egg white and fold in gently but thoroughly until evenly combined. Pour the filling into the prepared tin and bake for about 1 hour or until well risen, light golden brown and completely set in the centre when tested with the finger tips. Reduce the oven temperature slightly if the cakes starts to brown within 15 minutes. Place a spoon in the oven door and allow the cake to cool in the oven for at least one hour. Cool completely before loosening the sides, releasing the spring and removing the rim. Remove the cake with the paper lining to the base of an airtight container. Keep covered and refrigerated until required. When quite cold and firm, slip a large spatula or 2 egg lifters between the paper and the crust and transfer carefully to a serving platter. To serve, slice the cake neatly and serve with whipped cream or fruit coulis. To make 2 smaller cakes, use 2 x 220 mm springform cake tins and bake for about 45 minutes or until set. Place all the ingredients for the pastry in a food processor and process only until the pastry holds together. The pastry can also be made by hand. Just mix and knead the ingredients until a smooth pastry is formed. Press the pastry into a ball, cover or seal in clingwrap and refrigerate until required. Roll out the pastry on a floured surface with a floured rolling pin until quite thin and line the tin with the pastry. Trim the edge neatly with a sharp knife. Continue the recipe above from step 5. This is a magnificent sponge cake of which nobody ever tires! To cover the sides with as well, a double quantity of chocolate topping will be required. Combine the dry ingredients in a mixing bowl, and the water and oil and beat until evenly combined. Beat in the egg yolks only until blended. Beat the egg whites until firm and fold into the batter until evenly blended. Pour the batter into the prepared tin and bake about 35 minutes or until the cake is firm to the touch and thoroughly baked if tested with a skewer. Switch off the oven and allow the cake to cool in the oven for 5 minutes. Remove from the oven and cool in the tin for 5 minutes. Loosen the short sides and turn out the loaf onto a wire rack. Remove the paper and cool. Or, release the spring and remove the round cake from the pan carefully and cool on a wire rack. Place the chocolate and cream in a double-boiler and heat over simmering water until softened. Beat until the mixture is smooth and pour it over the cake, spreading over the top with a spatula and allowing streaks to run down the sides. Sprinkle with hundreds and thousands or chocolate shavings. Vary the kind of chocolate – e.g. use dark chocolate with almonds. Omit the topping and dust the cake with icing sugar only. Recipe by Carolié de Koster from the Art of Cooking Recipe Book p. 602. 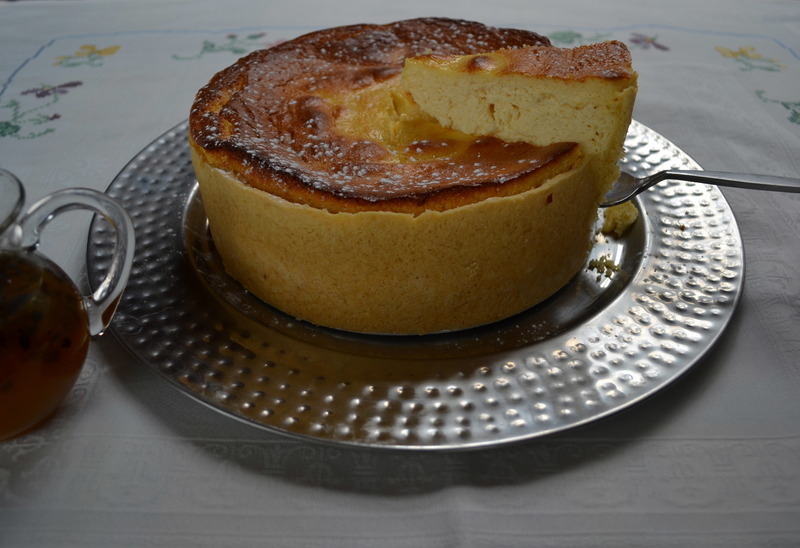 Also known as Souffle Cheesecake, this delightful cake is a cross between a cheesecake and a sponge cake. This quick and easy version is delicous with only 3 ingredients, but this simple cake lends itself to a variety of flavours. See the suggested variations below. Pre-heat the oven to 170ºC. Have a 22 cm spring form cake tin ready. Cut a circle the size of the bottom of the spring form cake tin. out of baking paper and place it in the tin. Spray itwith non-stick cooking spray. Cut a collar out of baking paper and spray it with non-stick cooking spray. Place the collar in the tin. Set the tin aside. Melt the chocolate in a double-boiler on the stove. When melted, stir until smooth. Set aside. Separate the eggs and beat the egg whites with an electric hand mixer to the firm peak stage. Add the cream cheese to the melted chocolate and mix well. Add one-third of the whipped egg whites into the chocolate mixture and mix well. Add the rest of the egg whites and mix well. Transfer the mixture to the prepared cake tin. Place the cake tin in a roasting pan or ovenproof dish and pour boiling water halfway up the side of the cake tin. I have had success without the water bath as well! Please the pan or dish in the oven and bake for 15 minutes. Lower the temperature of the oven to 160ºC and bake for a further 15 minutes. Switch the oven off and leave the cake in the oven for 15 minutes. Remove the cake tin from the oven and set it aside to cool. Remove the outer ring of the spring form pan and invert the cake onto a cake platter. Substitute the white chocolate for milk or dark chocolate. This cake can be turned into a banting-friendly cake if 85% or 90% dark chocolate is used. 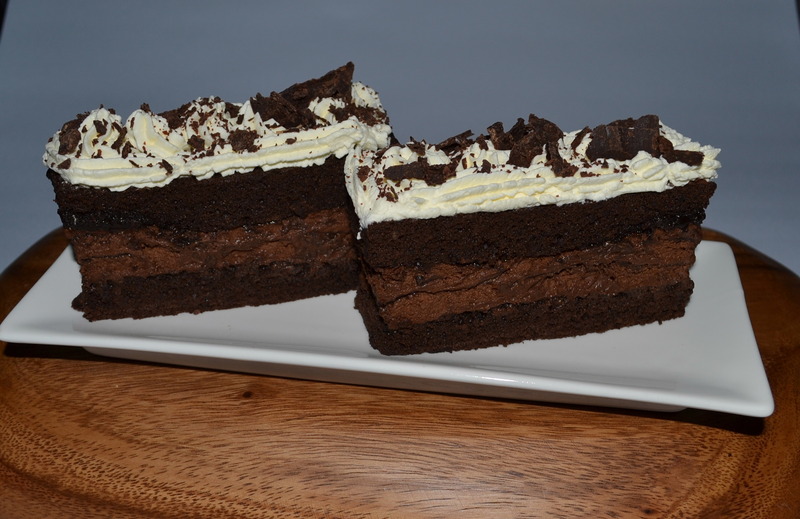 Drizzle the cake with melted white or dark chocolate or a combination of both! I used a 25 cm spring form cake, which rendered a very flat cake. I recommend baking it in a 22 cm spring form pan lined with baking paper in the bottom and a collar along the sides or a 30 cm quiche dish (see 2nd photo). 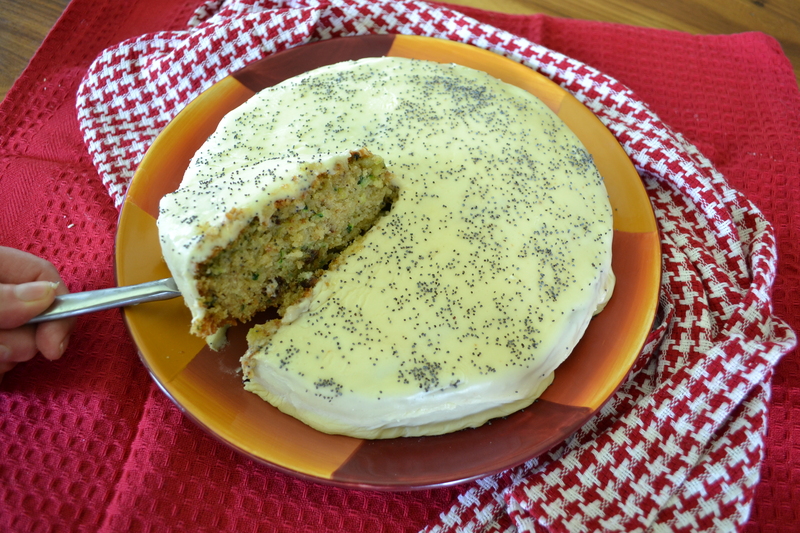 Surprise health cake lovers with this delicious and trendy vegetable based cake. Preheat the oven to 170 ºC and line the base of a 22 cm round spring-form tin with baking paper. Grease the sides of the tin with butter or cooking spray. Beat together the butter and sugar very well until creamy. Add the eggs, vanilla, lemon juice and zest if used and beat well until blended. Add all the remaining ingredients and stir until evenly combined. Spoon the batter into the prepared tin and spread evenly. Bake about 45 minutes or until quite firm to the touch, lightly browned and a metal skewer inserted comes out clean. Cool in the tin for 10 minutes and remove to a cooling rack. Place the icing sugar and butter into a mixing bowl and beat with an electric beater or a spoon to start mixing and soften the butter. Add the lemon juice a few drops at a time, beating and adding until a smooth and creamy icing results. Spread the icing decoratively over the top and sprinkle with poppy or chia seeds. I really miss being inspired every Thursday evening while watching Koekedoor on Kyknet. If you feel the same way, the good news is that there is a similar program called Great British Bake Off on BBC Lifestyle. The bad news is that the final is next week Tuesday at 20:00 on Channel 174. Last week contestants were given the task of making a Schichttorte as the technical challenge. It is a German cake which is traditionally cooked in stages under the grill to create 20 layers of different-coloured sponge. It kind of looks like a stack of very thin pancakes. It is based on the German baumkuchen cake which is made on a spit by brushing on even layers of batter and then rotating the spit around a heat source. Each layer is allowed to brown before a new layer of batter is poured. When the cake is removed and sliced, each layer is divided from the next by a golden line, resembling the growth rings on a crosscut tree. It is a traditional pastry in many countries throughout Europe and is also a popular snack and dessert in Japan. The characteristic rings that appear when sliced resemble tree rings, and give the cake its German name, Baumkuchen, which translates to “tree cake”. 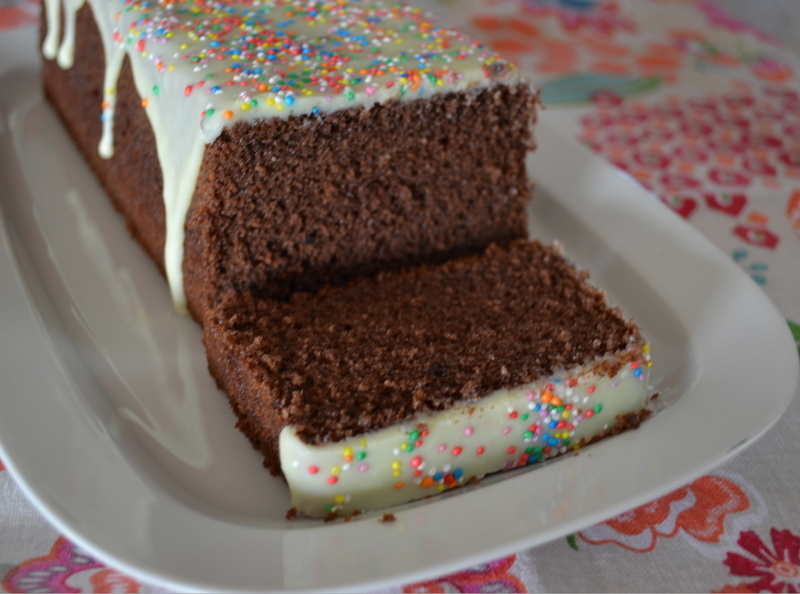 “Schichttorte” therefore is a simpler horizontally layered version of the cake which is baked without a spit and thus does not have circular rings but horizontal layers. 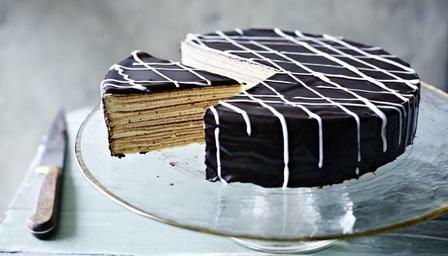 The horizontally layered version results in a baumkuchen that is more like a conventional cake in shape. It can also be baked in a conventional household oven that has a grilling element, whereas the traditional spit version requires special equipment normally not available in an average household. Typical ingredients includes eggs, caster sugar, plain flour, Amaretto, cocoa powder, dark chocolate, golden syrup and vanilla. But any mistakes or deviation from the recipe could cost the bakers a place in the final. An unusual combo which makes a stunning cake! Preheat the oven to 180ºC and line the base of a 20 cm square or round cake tin with baking paper. Grease the sides with butter. Beat together the butter and sugar until creamy and beat in the eggs one at a time. Add the dry ingredients and yoghurt or sour cream and beat again. Add the apples, coffee, vanilla and nuts and mix until combined. Turn the mixture into the prepared tin and bake 35 to 40 minutes or until a cake tester inserted in the centre comes out clean. Cool in the tin for 5 minutes, lift out and dust generously with icing sugar. Cut into squares or wedges to serve, as is or with whipped cream. A most enjoyable plain ring or loaf cake with a stunning texture and flavour and which lasts well for several days. Preheat the oven to 170ºC and grease a 20 cm ring mould with butter. Beat together the butter and sugar very well. Add the egg yolks one at a time while beating until very light and fluffy. Beat in the almond essence. Combine almonds, flour, baking powder and salt and beat into the egg mixture. Beat the egg whites until stiff and fold in gently until evenly blended. Spoon the batter into the prepared mould, smooth the top and bake about 25 to 30 minutes or until golden and firm to the touch. Cool in the mould for 5 minutes before turning out onto a cooling rack. In a container which can be sealed, combine 125 ml dried fruit such as golden sultanas, raisins, currants, glacé cherries and/or pineapple, OR use mixed cake fruit. Add 50 ml brandy, seal the container and shake well. Turn over and shake from time to time. Allow the fruit to soak and soften for at least an hour or overnight. Increase the baking powder to 5 ml, use only a few drops or omit the almond essence if preferred and add the soaked fruit with the dry ingredients to the egg yolk mixture. Complete as explained above and decorate with tiny chips of glace cherries together with the flaked almonds if preferred. Note To serve as dessert add strawberries, whipped cream and toasted brown skinned almonds! 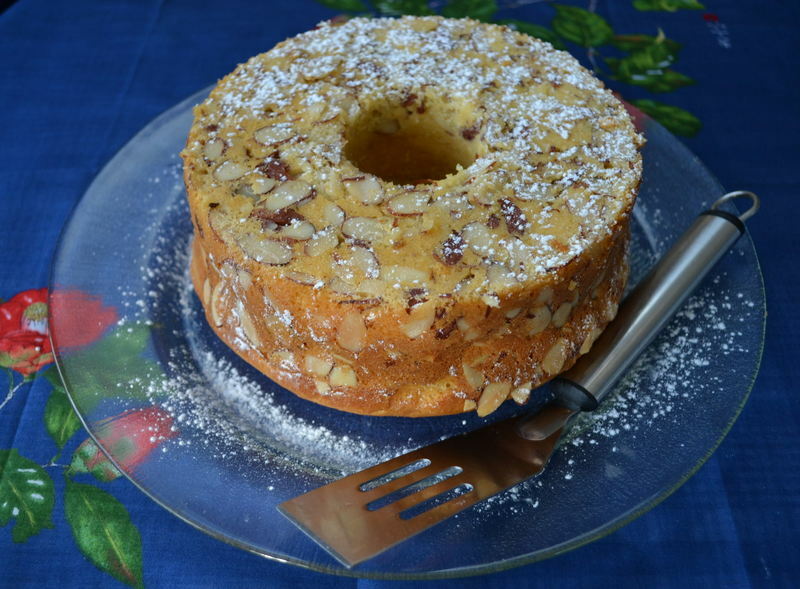 The combination of polenta and almond in this cake gives an interesting coarse texture which complements the citrus flavour. Line the bottom and sides of a 20 cm loose-bottomed cake tin with baking paper. In a medium-sized pot, cover the whole oranges with water and boil for 10 minutes. The oranges should be soft and tender but not mushy. Drain the water and cut the oranges in quarters. Place the oranges and 100 g of the castor sugar in a food processor and process until quite fine. Allow the orange pulp to cool slightly. Sift the flour and salt together 3 times. Cream the butter and remaining castor sugar in a large bowl with an electric beater. Fold in the dry ingredients, orange pulp, almonds and polenta and mix well. Spoon the batter into the tin and bake for 1 hour. Test with a skewer inserted into the centre of the cake. It should come out clean. If not, bake for another 10 minutes. To make the syrup, combine the juice, zest and castor sugar in a heavy-based saucepan. Stir over a low heat to melt the sugar. Boil the syrup for 5 minutes and pour some of the syrup over the cake the minute it comes out of the oven. Reserve the rest of the syrup to pour over the cake when serving. This decadent cake is ideal to make for a special occasion. Chocolate Sponge Layers are filled with mousse and set. The filling may be made with any flavour of chocolate – dark, milk, white or caramel – for white or caramel, use only baking chocolate. The sizes and shapes of the cakes as well as the kinds of finishes (glazes, icings, vermicelli, chocolate shavings, nuts, nut filled chocolates, fancy chocolate shapes, chocolate curls, chocolate honeycomb) are highly variable. Preheat the oven to 180°C and grease 2 x 26 cm spring form cake tins or one medium or two small loaf tins well with butter. Beat the eggs and vanilla and gradually beat in the sugar. Beat very well until quite thick and pale yellow. Sift together the dry ingredients over the beaten mixture and beat slowly while adding the water. Beat until evenly blended, divide between the prepared tins and spread evenly. Bake for about 8 minutes or until risen and firm if tested with the fingertips. Do not over-bake, for the cake will easily become too dry. Remove the cakes from the hot tins to prevent shrinkage and leave to cool. To make the filling, break up the chocolate coarsely and place with the milk into a suitable glass bowl. Cover and microwave on MEDIUM for 2 to 3 minutes or until the chocolate has softened completely if tested with the tip of a teaspoon. Stir the milk into the chocolate until evenly blended. Place the gelatine in a small jug, and cover with water and microwave on MEDIUM for 30 seconds or place over the steam of simmering water until melted. Add to the chocolate mixture and stir until blended. Beat the egg yolks and sugar very well with an electric beater until quite thick and pale yellow. Pour in the hot melted chocolate mixture and vanilla and beat until smooth. Using two bowls, beat the egg whites until firm but not dry and beat the cream until stiff. Add both to the chocolate mixture and fold in until evenly blended. Refrigerate about 20 minutes (while cake is baking and cooling) to become slightly firm before filling the cakes and completing. Line the base of a round spring-form tin which will hold the round layers snugly, with baking paper. Alternatively, line a suitable deep rectangular container, which will hold the sponge layers snugly, with a layer of baking paper, protruding well over the sides to help lift out the cake after it has set. Turn over one sponge layer into the container, peel off the paper and pour over the mousse. Turn over the second sponge layer onto the mousse, peel off the paper and cover the container. Refrigerate at least 3 to 4 hours or until completely firm and set. Release and remove the rim of the round tin and place on a board for cutting. Or lift out the rectangular cake with the aid of the paper and place on a board for cutting. Cut the round cake into 12 – 16 wedges with an electric knife – wipe the blades clean between cutting. Or cut the rectangular cake in half lengthwise and crosswise into 6 to 7 neat slices (about 10 mm x 40-50 mm). Whipped cream piped into patterns or rosettes on top of the slices can be decorated with chocolate shavings. 12 to 16 servings depending on the size of the slices. To support the mousse while setting a tin one size smaller than the size used is needed to allow for shrinkage of the sponge layers after baking. The cold, set cake slices neatly and has many possibilities as far as shape and size is concerned. The cake pictured below was decorated in chocolate leaves in autumn colours. To make the chocolate leaves, brush the chocolate over the underneath side (where the veins are) of cleaned ivy or rose leaves quite thickly. Wipe the chocolate off the edges with the tip of a finger to prevent the chocolate leaves from breaking when the leaves are removed. Place onto a tray and allow to set, or if the weather is warm, refrigerate a short while until set. Remove the plant leaves carefully and decorate the cake with the chocolate leaves and pressing them lightly into the topping or glaze to keep in place. Alternatively, transfer the chocolate leaves to a large container and refrigerate until ready to serve. Recipe by Carolié de Koster from the Art Of Cooking recipe book p. 593. This recipe is a sweet variation based on the basic recipe for Low Carb Oopsies and is a great substitute for the traditional sponge cake base used when making a sweet roulade. Line a 38 cm x 26 cm Swiss roll tin with baking paper (it should extend over the sides) and spray with non-stick cooking spray. Transfer the egg whites to a large mixing bowl and add the salt. Set it aside. Transfer the egg yolks to a second mixing bowl and add the cheese, baking powder, gelatine powder and psyllium husks, if used. Mix well. Beat the egg whites and salt with an electric hand mixer until very stiff. Gently fold the egg whites into the egg yolk mixture. Pour the mixture into the prepared tin, spread evenly and bake at 170 ºC for about 30 minutes or until just firm and very lightly browned. To make the filling, whip the cream until stiff in a food processor and stir in the honey and raspberries. Set it aside. Turn out the roulade onto a second sheet of baking paper and carefully peel the baking paper from the roulade base. Spread the filling evenly over the base leaving 3 cm at the one short end of the base. Roll the base up carefully from the other end with the aid of the paper. Transfer the roulade to a suitable serving platter and wrap with clingfilm. 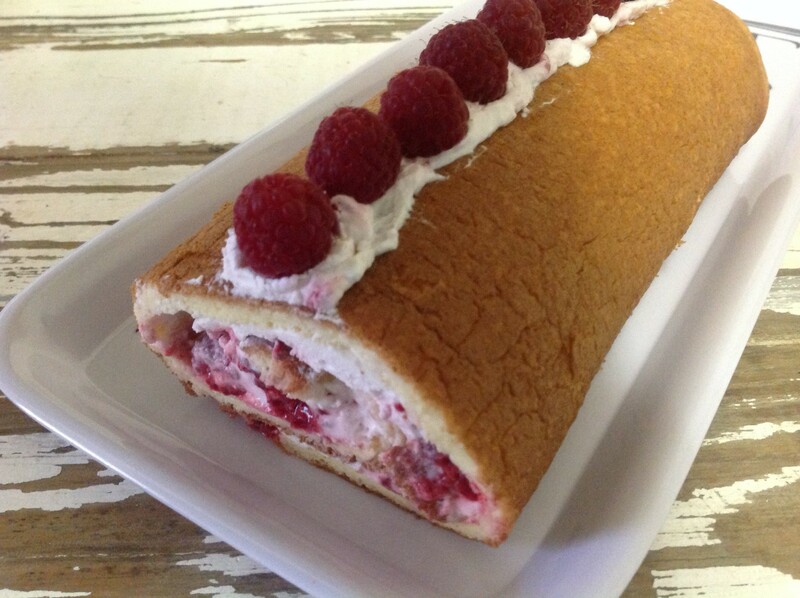 Refrigerate for at least 30 minutes before serving the roulade whole garnished with whipped cream and raspberries. Alternatively, cut the roll into 2 to 3 cm thick slices, arrange the slices onto individual plates or a serving platter and garnish.